Contains organisms that will degrade a wide range of hydrocarbons: gasoline, diesel, crude oil, benzene, toluene, ethyl benzene and xylene. Due to the increase in industrial and agricultural activities and exports of wastes, not only traditional industrialized countries, but all nations have widespread soil pollution. Soil may have become polluted by either spillage or leakage during production, handling or use of industrial material. This includes activities to gain raw materials, such as mining and oil drilling. Locations may have also been used as disposal sites for diverse wastes. Contaminated land sites are health hazards for human beings and are unsuitable for housing or agriculture. At present, petroleum and petroleum-derived products still cause the most pervasive environmental contamination. Since they are generally susceptible to naturally occurring microbial activity, they have become a main target for bioremediation. Most in situ bioremediation involves the stimulation of indigenous microbial populations (e.g. by adding nutrients and aeration). Since the soil is not removed, this method is relatively cost effective. Non-biological treatments such as landfill, chemical extraction, electro-reclamation and incineration are effective, but have a highenergy demand. Bioremediation at the site of the contamination is much less input-demanding. Land Treatment — There is no standard protocol for the bioremediation of contaminated soils. However, there are several guidelines that should be followed to obtain the optimum degradation rates of the organic contaminants. Bioremediation of contaminated soils may take place in a lined treatment cell so that the runoff resulting from the degradation of the wastes can be collected. The soil is typically treated in lifts of 20cm to 30cm to allow maximum oxygen transfer through the soil for the microorganisms. This transfer is usually accomplished by tilling, which provides for the essential intimate contact needed between the bacterial cultures and the organic contaminants. 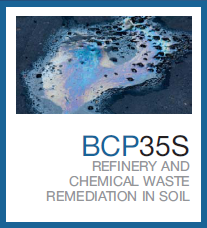 To clean up small areas: use BCP35S at the rate of 1kg/20m2 of contaminated soil. Rake or till the soil. Maintain the area as if growing a lawn and repeat application as necessary. For larger projects: use 100kg BCP35S plus 200L of STIMULUS per 1,500m3 of soil. For deeper contaminated sites, use 100 kg/300m3 of soil. Repeated applications may be needed for heavily contaminated soil. BCP35S can be applied to the soil with any appropriate fertilizer or seed spreading equipment. Dry or wet application can be used. Direct Injection — Direct injection of the bacteria and nutrient solutions can be used for treatment. This method is site specific and an experienced contractor should be contacted. Applications of BCP35S should be mixed with clean warm water for a minimum of two hours before injection. Use in accordance with all Federal and State regulations. Results will depend upon soil types and climate conditions. Soil pH, nutrient levels, oxygen availability, and moisture content are critical to the success of bioremediation. All of the requirements will vary according to the soil, weather conditions (humidity, temperature, rainfall amounts), indigenous microbial population, contaminants involved, the concentration of those contaminants, and the amount of time allowed for cleaning up the site.